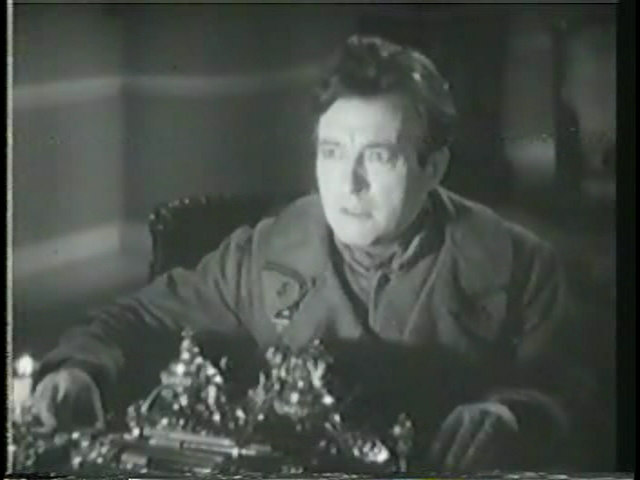 An anti-war editorialist (Claude Rains) goes mad when he discovers that his editor (Lionel Atwill) has betrayed his trust by collaborating with munitions manufacturers. 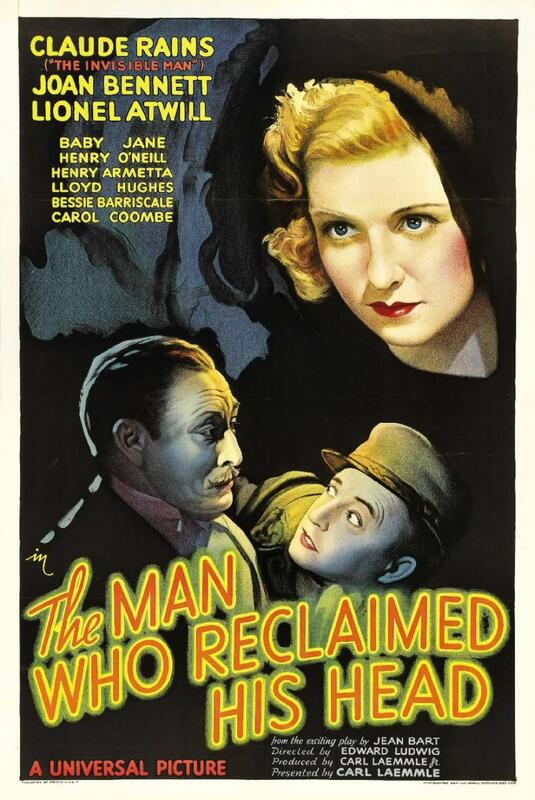 The Man Who Reclaimed His Head — based on a stage play by Jean Bart — is not, as its provocative title would suggest, a horror flick; while insanity and murder are involved, they ultimately take a back seat to the central story of a freelance writer (Rains) so in love with his beautiful young wife (Joan Bennett) that he agrees to work for an unscrupulous former boss (Atwill), only to find his trust sorely misplaced. 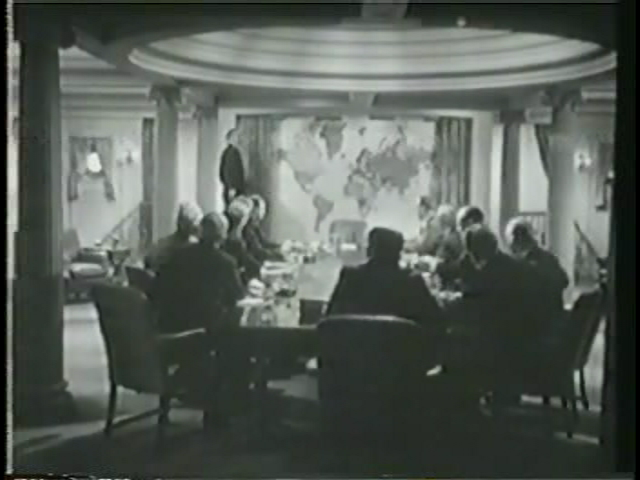 Unfortunately, while the expose of “special interests” driving the machinery of war — and the complicity of the media in such efforts — was surely shocking at the time of the film’s release, today’s audiences will find such nefarious collaborations sadly commonplace, and thus may have a hard time relating to the enormity of Rains’ emotions (not to mention his drastic actions). Rains — always a compelling actor — is excellent in the title role (indeed, Peary nominates his performance for an Alternate Oscar), but Atwill’s “evil” character isn’t fleshed out nearly enough; meanwhile, Bennett (capable of much better) emerges as little more than a pretty face. While it’s not “must see” viewing for all film fanatics, however, Claude Rains fans will certainly want to check this one out. No, but it’s worth a look. Listed as a Sleeper and a Personal Recommendation in the back of Peary’s book. First viewing. Ultimately not a must – though you almost can’t go wrong if Claude Rains is in the cast. We’re so accustomed to savoring his more forceful performances, that it is odd to see him being comparatively passive here. Still, he delivers – making his part better than it really is. The film begs the question, ‘Just how pure can one be in an increasingly duplicitous world?’ That alone may keep the film relevant and worth seeing (if it doesn’t become lost, which it’s in danger of becoming). But a number of the film’s particulars keep it from being first-rate: there’s an element of Rains’ character that seems flaccid and doormat-ish when he has untethered freedom – and why is he operating in a vacuum when he has a cause? ; (as noted) Atwill is underdeveloped and seems to change ideological course too quickly; Bennett’s character comes off as schizophrenic in terms of what she really wants in life; finally, there are too many scenes of the child being called on to say/do too much for someone of that age (which becomes insufferable).